That’s not the case with Cheerwine. “On all occasions, it’s good taste,” those signs promised – and 101 years later, it still is. If you’re from North Carolina or have spent any time in the superior Carolina, you’re nodding your head in agreement. The story of this extra-fizzy cherry soda began in Salisbury, North Carolina, in more or less the same place where new chapters are still being added. 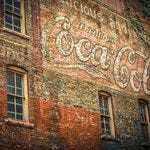 According to the North Carolina History Project, a businessman named Lewis D. Peeler bought into a Kentucky bottling company in 1913 and started selling its signature drink, Mint Cola. When the company went bankrupt (possibly because Mint Cola sounds disgusting), he bought the local franchise, renamed it the Carolina Beverage Corporation and started to work on a new, less minty soda. Sugar had been rationed due to World War I, so Peeler used cherry flavoring to sweeten his new soda, which he called Cheerwine, getting the ‘cheer’ because he deemed it a “pleasure” to drink, and ‘wine’ because of its deep burgundy color. By 1924, Cheerwine was already outselling Mint Cola, again, because there’s no way it didn’t taste like carbonated toothpaste. Peeler died in 1931, and his son Clifford took over as the company president, leading it through the dark days of the Great Depression. As Cheerwine’s own corporate timeline says, “it was good to have a product with the word ‘Cheer’ in the name back then.” Fast-forward about 87 years, and the Carolina Beverage Corporation is still owned and managed by the fifth generation of the Peeler family. Last May, it commemorated its 100th year with a festival in Salisbury and, this May, another festival was held for its 101st year. More than 30,000 people attended the second celebration of “life, liberty and the pursuit of cheerfulness,” because why would you not spend an afternoon drinking Cheerwine slushies and buying “Drink Cheerwine” t-shirts? It’s hard to underestimate the appeal of the soda in this state; Our State magazine pointed out that when Krispy Kreme – another North Carolina company – released a limited-edition Cheerwine cream filled donut, it sold more than a million of them in less than a month. 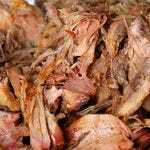 Cheerwine refers to itself as “Southern food’s trusty sidekick,” and there might not be a better pairing than a cold Cheerwine and a plate of North Carolina BBQ. It’s the perfect accompaniment, whether you enjoy the vinegar tang of a Lexington-style chopped plate or the wrong kind. (Sorry, tomato-based Easterners. You’ll come around eventually.) If you go into one of the state’s most authentic BBQ joints, there’s a better-than-average chance that Cheerwine will be an option at the soda fountain. So let’s raise a Cheerwine toward Salisbury, toward the late L.D. Peeler and toward Andy Griffith. Wholesomeness has never tasted so good.